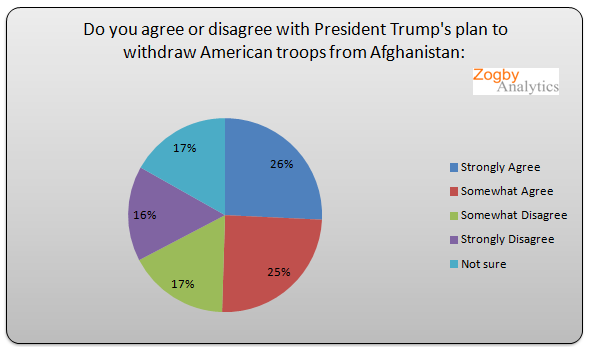 Democratic voters, long opposed to the wars in Afghanistan and Iraq, now disagree with President Trump’s call to withdraw troops in Afghanistan and Syria, according to a new survey. And the likely reason they have flipped is simply to oppose the president. On Trump’s Syria move, the latest Zogby Analytics Poll found that 52 percent of Democrats oppose the troop withdrawal. Just 31 percent agree with Trump’s move. The poll analysis called it a “stunning reversal” of years of results where Democrats wanted troops withdrawn from U.S.-led wars. “Is this a shift in policy on the part of Democratic leaders, or Democrats disagreeing with any proposal put forth by the president? Are the Democrats the new party of ‘no,’ and willing to obstruct anything the president does out of mere spite? Presently, the data isn’t painting a different picture,” said the analysis from Jonathan Zogby. Among all voters surveyed, his poll found that more back withdrawing the troops from Syria and Afghanistan.